The ocean turns red (or orange) (or blue). Much of the luminescence that we see in the ocean comes from bioluminescent dinoflagellates — single-celled protists which can live by photosynthesis or by ingesting other organisms. 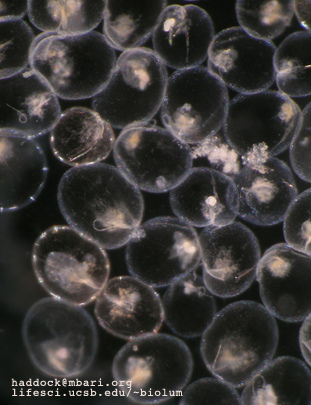 At times, dense blooms of dinoflagellates can occur, and a species can increase to form huge numbers. Such occurrences are called red tides. When the species involved is toxic, these red tides can harm marine life and make shellfish dangerous to eat. When the species is bioluminescent, it can produce spectacular displays which light up crashing waves and the wakes of boats. 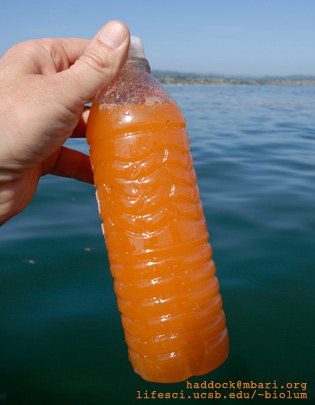 During the daytime, due to the pigmentation of the dinoflagellates, the water can turn a deep red, brown, or orange color, giving red tides their name. A bioluminescent dinoflagellate can make a flash of light inside its cell when disturbed. This light is the result of a chemical reaction using a light emitting molecule called luciferin. In the case of dinoflagellates, this luciferin has a structure very similar to that of chlorophyll, which the organism might use to gather light during the day. Some of the brightest kinds of dinoflagellates leading to visible blooms are Noctiluca and Protoperidinium, which can eat other microorganisms, and Lingulodinium (Gonyaulax) or Pyrocystis (a tropical genus), which can photosynthesize. Left alone, dinoflagellates will not make much light, but if something tries to capture them, or swims past and stirs up the water, then it will be triggered to display. There are two suspected functions of these flashes: one is to directly startle the organism that is trying to eat the dino, and the second is as a burglar alarm. Burglar alarms means that if something is swimming through a large bloom of dinoflagellates, then it will leave a trail of light that might attract other predators, to eat the organism which is threatening the dinos. For example a shrimp grazing on dinoflagellates might be captured by a fish which notices the light it stimulates. Blooms of dinoflagellates happen when conditions are right, meaning there are plenty of nutrients, either for the dinoflagellates themselves, or to encourage the growth of the algae that some dinoflagellates eat. The timing of the bloom can follow a regular sequence: nutrients enter the ocean (from rivers or from deep water brought to the surface after string winds.) After this influx, the dinoflagellates will divide and their numbers will increase, almost like a culture of cells in a flask. If the ocean is calm, then the bloom will not get mixed around, and the dinoflagellates will for dense layers. While these layers persist is when the displays are most visible to people visiting the sea shore or boating through the waters. Such conditions can occur at any point in the year, but often in late summer or fall, when there are alternating periods of nutrient upwelling and calm seas. If you get a chance to a glowing red tide, take it! Try to find a night when the moon is new, or hasn't yet risen. In most areas, the displays will only last until the next strong winds mix the dinoflagellates out of the surface layers. 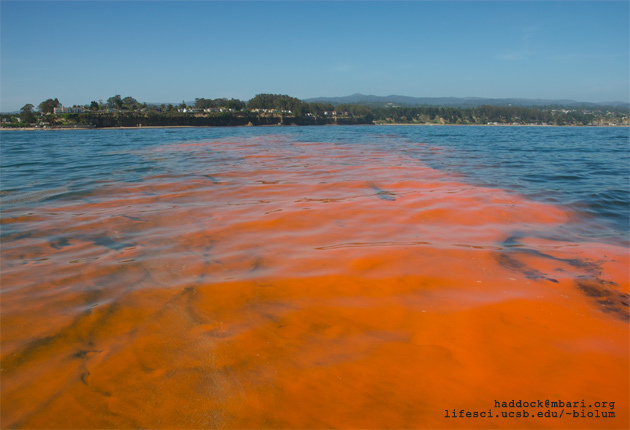 In Monterey Bay, California, in May 2011, there were several areas that experienced red tides, consisting of the species Noctiluca scintillans. As the bloom matured and the cells aged, their buoyancy increased, and they floated to the surface to form an orange slick about an inch thick. Within the slick, the dinoflagellates were densely packed, with 9500 of the 0.5 mm diameter cells per milliliter (nearly 10 million per liter). Noctiluca species are not "armored" nor are they photosynthetic. They use a little tentacle or flagellum to ingest other phytoplankton cells, including other smaller dinoflagellates and diatoms. As a result, they don't have high amounts of chlorophyll in them, which will become important below. Using an autonomous underwater vehicle called an AUV (basically a smart and friendly torpedo) we are able to measure the oceanographic conditions over a large area. Bioluminescence was high in areas of high fluorescence (left side of the images below). 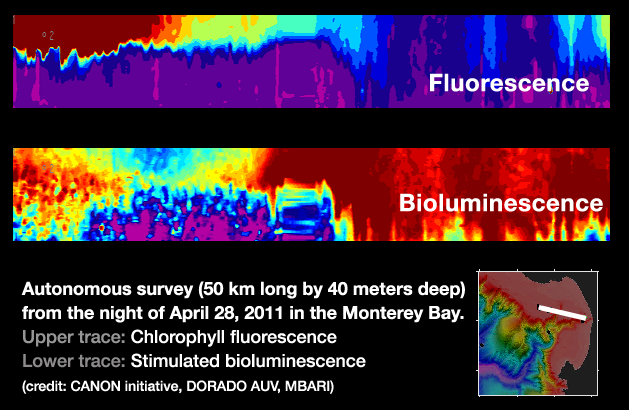 This indicates co-occurrence of luminescence with phytoplankton like diatoms or photosynthetic dinoflagellates, but it was even higher in areas where the fluorescence (and thus chlorophyll) was low (right side of the images). 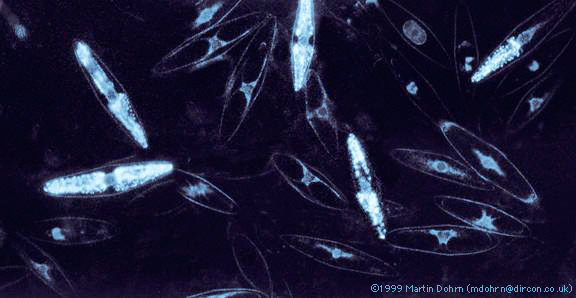 This indicates either zooplankton producing the luminescence or, in this case, non-photosynthetic dinoflagellates like Noctiluca. If you come across something interesting like a red tide, or jellyfish on the beach, report them to the citizen science database located at jellywatch.org. | E-mail . | Research forum | Bioluminescence Info Page.